"Stereo Camera", "Extended Depth-of-Field Camera" and "Polarization Camera" have been updated. "Metal-catalyst-free Polymerization of PLA at Low Temperature" has been posted. "High-resolution Electrodes Patterning Technology Using Printing Methods" has been posted. "Product Life-cycle Environmental Impact Assessment Technology" has been posted. "Rewritable Laser System" has been posted. New Category Pages about "Industrial Technologies" and "White Paper" have been added. 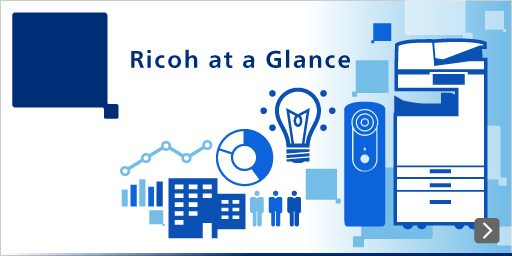 White Paper "Ricoh's New Collaboration for the Next Business (Chinese Version)(PDF:18P/862KB)" has been added. Technology Top Message "Imagining the Future to Create Change" has been posted. "Crystallization of PZT Film by Laser Annealing Technology"has been posted. White Paper "Creating a Sustainable Society through Environmental Management (English Version) (PDF:20P/1,759KB)", and "Creating a Sustainable Society through Environmental Management (Chinese Version) (PDF:19P/1,906KB)" have been added. "Technology for Improving Image Density Uniformity","Image Quality Improvement Technology on Textured Media" pages have been added. Dewarping Projected Image"has been posted. "Cart Production Line","On-demand Toner Filling Machine","Downsized Production Line for Photoconductors" pages have been added. "Research on the Office of the Future (with video)" has been added.